High Efficiency of Heat transfer plates,Wide distribution pattern are some of the quality characteristics of our Products. It helps our customer high productivity by reducing the down time. With firm commitment to quality, we are manufacturing, supplying, distributing, importing and exporting a comprehensive range of Brazed Plate Heat Exchangers. High quality material that is sourced from vendors of high repute after scouring the market is used in the manufacturing process. Post-production, we inspect these products on certain parameters of quality to ensure their defect-free nature. 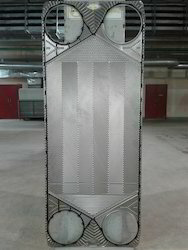 In order to fulfill the ever changing demands of our clients, we have been engaged in offering a quality range of Semi Welded Plate Heat Exchangers. The offered range comprises plates that are welded using advanced laser welding techniques and other channels are gasketed. To ensure their flawlessness, we inspect these rigorously on certain well-defined parameters of quality. 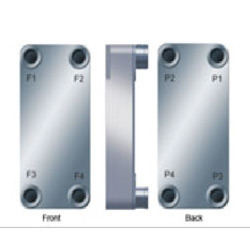 We can offer quality Replacement spares for GEA Ecoflex PHE -- Both PHE plate and Gasket. Gaskets : NBR, HT NBR, HNBR, EPDM, Viton. We offer CIP pump for heat exchanger cleaning. 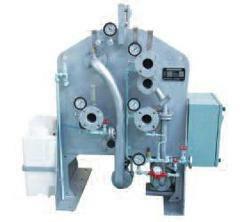 This is skid mounted system with PH indicator and heater for heating the chemicals. Cleaning in place is a cleaning procedure without dismantling the plates from frame and circulating preselected cleaning agent in the reverse direction and then draining of the cleaning agent, if necessary rinsed with water. needed for opening & cleaning. 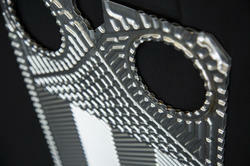 Saves Cost as CIP prolongs life of gaskets in case of Gasketted PHE. We can support in delivery of both single and multi-stage freshwater distillers, the choice of which depends on the intended application and whether it is going to be installed on board a vessel or on a rig. 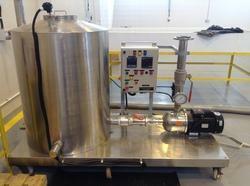 Single-stage freshwater distillers require a relatively large amount of energy to operate, but are less expensive than their multi-stage counterparts. They are a common choice for vessels, as the engines on board produce large amounts of excess heat which can be utilized in the single-stage freshwater distillers, resulting both in the production of freshwater as well as the disposal of unwanted heat. The excess energy is thus put to good use and benefits the entire vessel, making single-stage freshwater distillers an obvious choice. Multi-stage freshwater distillers, on the other hand, are more expensive but produce more freshwater and require less energy. The energy from the evaporation process is reused multiple times making multi-stage solutions ideal for rigs and other offshore platforms that do not generate excess heat and must instead actively produce energy. This way, the larger investment pays off in the long run with reduced energy costs for operation and increased freshwater production.